Paul Anthony Samuelson (May 15, 1915 – December 13, 2009) was an American economist and the first American to win the Nobel Memorial Prize in Economic Sciences. The Swedish Royal Academies stated, when awarding the prize in 1970, that he "has done more than any other contemporary economist to raise the level of scientific analysis in economic theory". Economic historian Randall E. Parker has called him the "Father of Modern Economics", and The New York Times considered him to be the "foremost academic economist of the 20th century". Samuelson was likely the most influential economist of the later 20th century. In 1996, when he was awarded the National Medal of Science, considered to be America's top science-honor, President Bill Clinton commended Samuelson for his "fundamental contributions to economic science" for over 60 years. Samuelson considered mathematics to be the "natural language" for economists and contributed significantly to the mathematical foundations of economics with his book Foundations of Economic Analysis. He was author of the best-selling economics textbook of all time: Economics: An Introductory Analysis, first published in 1948. It was the second American textbook that attempted to explain the principles of Keynesian economics. It is now in its 19th edition, having sold nearly 4 million copies in 40 languages, including Russian, French, Greek, Slovak, Chinese, Portuguese, German, Spanish, Polish, Japanese, Czech, Vietnamese, Hungarian, Indonesian, Swedish, Croatian, Dutch, Turkish, Hebrew, Italian, and Arabic. James Poterba, former head of MIT's Department of Economics, noted that by his book, Samuelson "leaves an immense legacy, as a researcher and a teacher, as one of the giants on whose shoulders every contemporary economist stands". He entered the University of Chicago at age 16, during the depths of the Great Depression, and received his PhD in economics from Harvard. After graduating, he became an assistant professor of economics at Massachusetts Institute of Technology (MIT) when he was 25 years of age and a full professor at age 32. In 1966, he was named Institute Professor, MIT's highest faculty honor. He spent his career at MIT where he was instrumental in turning its Department of Economics into a world-renowned institution by attracting other noted economists to join the faculty, including Robert M. Solow, Franco Modigliani, Robert C. Merton, Joseph E. Stiglitz, and Paul Krugman, all of whom went on to win Nobel Prizes. He served as an advisor to Presidents John F. Kennedy and Lyndon B. Johnson, and was a consultant to the United States Treasury, the Bureau of the Budget and the President's Council of Economic Advisers. Samuelson wrote a weekly column for Newsweek magazine along with Chicago School economist Milton Friedman, where they represented opposing sides: Samuelson, as a self described "Cafeteria Keynesian", claimed taking the Keynesian perspective but only accepting what he felt was good in it. By contrast, Friedman represented the monetarist perspective. Together with Henry Wallich, their 1967 columns earned the magazine a Gerald Loeb Special Award in 1968. Samuelson died on 13 December 2009, at the age of 94. Samuelson was born in Gary, Indiana, on 15 May 1915, to Frank Samuelson, a pharmacist, and the Ella née Lipton. His family, he later said, was "made up of upwardly mobile Jewish immigrants from Poland who had prospered considerably in World War I, because Gary was a brand new steel-town when my family went there". In 1923, Samuelson moved to Chicago where he graduated from Hyde Park High School (now Hyde Park Career Academy). He then studied at the University of Chicago and received his Bachelor of Arts degree there in 1935. He said he was born as an economist, at 8.00am on January 2, 1932, in the University of Chicago classroom. The lecture mentioned the cause was on the British economist Thomas Malthus, who most famously studied population growth and its effects. Samuelson felt there was a dissonance between neoclassical economics and the way the system seemed to behave; he said Henry Simons and Frank Knight were a big influence on him. He next completed his Master of Arts degree in 1936, and his Doctor of Philosophy in 1941 at Harvard University. He won the David A. Wells prize in 1941 for writing the best doctoral dissertation at Harvard University in economics, for a thesis titled "Foundations of Analytical Economics", which later turned into Foundations of Economic Analysis. As a graduate student at Harvard, Samuelson studied economics under Joseph Schumpeter, Wassily Leontief, Gottfried Haberler, and the "American Keynes" Alvin Hansen. Samuelson moved to MIT as an assistant professor in 1940 and remained there until his death. Samuelson's family included many well-known economists, including brother Robert Summers, sister-in-law Anita Summers, brother-in-law Kenneth Arrow and nephew Larry Summers. Assistant professor of economics at M.I.T, 1940, associate professor, 1944. Member of the Radiation Laboratory 1944–45. Professor of international economic relations (part-time) at the Fletcher School of Law and Diplomacy in 1945. Professor of economics at MIT beginning in 1947 and Institute Professor beginning in 1962. Vernon F. Taylor Visiting Distinguished Professor at Trinity University (Texas) in spring 1989. Samuelson died after a brief illness on December 13, 2009, at the age of 94. His death was announced by the Massachusetts Institute of Technology. James M. Poterba, an economics professor at MIT and the president of the National Bureau of Economic Research, commented that Samuelson "leaves an immense legacy, as a researcher and a teacher, as one of the giants on whose shoulders every contemporary economist stands". Susan Hockfield, the president of MIT, said that Samuelson "transformed everything he touched: the theoretical foundations of his field, the way economics was taught around the world, the ethos and stature of his department, the investment practices of MIT, and the lives of his colleagues and students". Consumer theory, where he pioneered the revealed preference approach, which is a method by which one can discern a consumer's utility function, by observing their behavior. Rather than postulate a utility function or a preference ordering, Samuelson imposed conditions directly on the choices made by individuals – their preferences as revealed by their choices. Welfare economics, in which he popularised the Lindahl–Bowen–Samuelson conditions (criteria for deciding whether an action will improve welfare) and demonstrated in 1950 the insufficiency of a national-income index to reveal which of two social options was uniformly outside the other's (feasible) possibility function (Collected Scientific Papers, v. 2, ch. 77; Fischer, 1987, p. 236). Capital theory, where he is known for 1958 consumption loans model and a variety of turnpike theorems and involved in Cambridge capital controversy. Finance theory, in which he is known for the efficient-market hypothesis. International economics, where he influenced the development of two important international trade models: the Balassa–Samuelson effect, and the Heckscher–Ohlin model (with the Stolper–Samuelson theorem). Macroeconomics, where he popularized the overlapping generations model as a way to analyze economic agents' behavior across multiple periods of time (Collected Scientific Papers, v. 1, ch. 21) and contributed to formation of the neoclassical synthesis. Market economics: Samuelson believed unregulated markets have drawbacks, he stated, "free markets do not stabilise themselves. Zero regulating is vastly suboptimal to rational regulating. Libertarianism is its own worst enemy!" Samuelson strongly criticised Friedman and Friedrich von Hayek arguing their opposition to state intervention "tells us something about them rather than something about Genghis Khan or Franklin Roosevelt. It is paranoid to warn against inevitable slippery slopes ... once individual commercial freedoms are in any way infringed upon". More than any other contemporary economist, Samuelson has helped to raise the general analytical and methodological level in economic science. He has simply rewritten considerable parts of economic theory. He has also shown the fundamental unity of both the problems and analytical techniques in economics, partly by a systematic application of the methodology of maximization for a broad set of problems. This means that Samuelson's contributions range over a large number of different fields. He was also essential in creating the neoclassical synthesis, which ostensibly incorporated Keynesian and neoclassical principles and still dominates current mainstream economics. In 2003, Samuelson was one of the ten Nobel Prize–winning economists signing the Economists' statement opposing the Bush tax cuts. Stanislaw Ulam once challenged Samuelson to name one theory in all of the social sciences which is both true and nontrivial. Several years later, Samuelson responded with David Ricardo's theory of comparative advantage: "That it is logically true need not be argued before a mathematician; that is not trivial is attested by the thousands of important and intelligent men who have never been able to grasp the doctrine for themselves or to believe it after it was explained to them." To prove that Wall Street is an early omen of movements still to come in GNP, commentators quote economic studies alleging that market downturns predicted four out of the last five recessions. That is an understatement. Wall Street indexes predicted nine out of the last five recessions! And its mistakes were beauties. 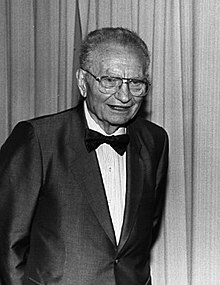 In the early editions of his famous, bestselling economics textbook Paul Samuelson joked that GDP falls when a man "marries his maid". (See The Economist, The trouble with GDP). 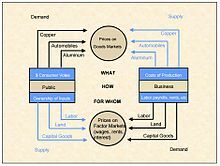 economic systems (including a market and an economy) in stable equilibrium. In the first tenet, his views presented the idea that all actors, whether firms or consumers, are striving to maximize something. They could be attempting to maximize profits, utility, or wealth, but it did not matter because their efforts to improve their well-being would provide a basic model for all actors in an economic system. His second tenet was focused on providing insight on the workings of equilibrium in an economy. Generally in a market, supply would equal demand. However, he urged that this might not be the case and that the important thing to look at was a system's natural resting point. Foundations presents the question of how an equilibrium would react when it is moved from its optimal point. Samuelson was also influential in providing explanations on how the changes in certain factors can affect an economic system. For example, he could explain the economic effect of changes in taxes or new technologies. In the course of analysis, comparative statics, (the analysis of changes in equilibrium of the system that result from a parameter change of the system) is formalized and clearly stated. The chapter on welfare economics "attempt(s) to give a brief but fairly complete survey of the whole field of welfare economics" (Samuelson, 1947, p. 252). It also exposits on and develops what became commonly called the Bergson–Samuelson social welfare function. It shows how to represent (in the maximization calculus) all real-valued economic measures of any belief system that is required to rank consistently different feasible social configurations in an ethical sense as "better than", "worse than", or "indifferent to" each other (p. 221). Samuelson is also author (and since 1985 co-author) of an influential principles textbook, Economics, first published in 1948, now in its 19th edition. The book has been translated into forty-one languages and sold over four million copies; it is considered the best-selling economics textbook in history. Samuelson was once quoted as saying, "Let those who will write the nation's laws if I can write its textbooks." Written in the shadow of the Great Depression and the Second World War, it helped to popularize the insights of John Maynard Keynes. A main focus was how to avoid, or at least mitigate, the recurring slumps in economic activity. Samuelson wrote: "It is not too much to say that the widespread creation of dictatorships and the resulting World War II stemmed in no small measure from the world's failure to meet this basic economic problem [the Great Depression] adequately." This reflected the concern of Keynes himself with the economic causes of war and the importance of economic policy in promoting peace. Samuelson's influential textbook has been criticized for including comparative growth rates between the United States and the Soviet Union that were inconsistent with historical GNP differences. The 1967 edition extrapolates the possibility of Soviet/US real GNP parity between 1977 and 1995. Each subsequent edition extrapolated a date range further in the future until those graphs were dropped from the 1985 edition. In 1989, Samuelson commented on the economics of the Soviet Union and Marxism: "Contrary to what many skeptics had earlier believed, the Soviet economy is proof that ... a socialist, command economy can function and even thrive." The Revolutions of 1989 happened during the same year and the Soviet Union broke up two years later. Samuelson's book was the second one that attempted to introduce to a wider audience Keynesian economics, yet by far the most successful one. Canadian economist Lorie Tarshis, who had been a student attending Keynes's lectures at Harvard in the 1930s, published in 1947 an introductory textbook that incorporated his Tarshis's lecture notes, titled The Elements of Economics. It was attacked by trustees of, and donors, to American colleges and universities as preaching a "socialist heresy". William F. Buckley Jr. attacked the Tarshis analysis as "communist inspired". There are 388 papers in Samuelson's Collected Scientific Papers. Stanley Fischer (1987, p. 234) writes that taken together they are "unique in their verve, breadth of economic and general knowledge, mastery of setting, and generosity of allusions to predecessors." Samuelson was co-editor, along with William A. Barnett, of Inside the Economist's Mind: Conversations with Eminent Economists (Blackwell Publishing, 2007), a collection of interviews with notable economists of the 20th century. Fellow, council member and past vice-president of the Royal Economic Society. Samuelson, Paul A. (1947), Enlarged ed. 1983. Foundations of Economic Analysis, Harvard University Press. Samuelson, Paul A. (1952), "Economic Theory and Mathematics – An Appraisal," American Economic Review, 42(2), pp. 56–66. Samuelson, Paul A (1954). "The Pure Theory of Public Expenditure". Review of Economics and Statistics. 36 (4): 387–89. doi:10.2307/1925895. JSTOR 1925895. Samuelson, Paul A. (1958), Linear Programming and Economic Analysis with Robert Dorfman and Robert M. Solow, McGraw–Hill. Chapter-preview links. Samuelson, Paul A. (1966), Vol. 1, 1937–mid-1964. Samuelson, Paul A. (1966), Vol. 2, 1937–mid-1964. Samuelson, Paul A. (1972), Vol. 3, mid-1964–1970. Samuelson, Paul A. (1977), Vol. 4[permanent dead link], 1971–76. Samuelson, Paul A. (2011), Vol. 6[permanent dead link], 1986–2009. Description. Samuelson, Paul A. (2011), Vol. 7[permanent dead link], 1986–2009. ^ De Vroey, Michel; Malgrange, Pierre (2012). "From The Keynesian Revolution to the Klein–Goldberger model: Klein and the Dynamization of Keynesian Theory". History of Economic Ideas. 20 (2): 113–36. ^ Merton, Robert C. (1970), Analytical optimal control theory as applied to stochastic and non-stochastic economics. Ph.D. dissertation, Massachusetts Institute of Technology. ^ a b c d Frost, Greg (Dec 13, 2009). "Nobel-winning economist Paul A. Samuelson dies at age 94". MIT News. "In a career that spanned seven decades, he transformed his field, influenced millions of students and turned MIT into an economics powerhouse"
^ a b c Weinstein, Michael M. (December 13, 2009). "Paul A. Samuelson, Economist, Dies at 94". New York Times. ^ Solow, Robert (2010). "On Paul Samuelson". Challenge. ^ "Year 107 – 1967: Economics: An Introductory Analysis by Paul A. Samuelson | 150 Years in the Stacks". libraries.mit.edu. Retrieved 2016-04-26. ^ Weinstein, Michael M. (14 December 2009). "Paul A. Samuelson, Economist, Dies at 94". The New York Times. ISSN 0362-4331. Retrieved 2016-04-26. ^ Parker, Randall E. (2002). Reflections on the Great Depression. Cheltenham: Edward Elgar. pp. 27–28. ^ Backhouse, R. E. (2014). "Paul A. Samuelson's Move to MIT". History of Political Economy. 46: 60. doi:10.1215/00182702-2716118. ^ a b "Nobel economics laureate Samuelson died at 94". Reuters. December 13, 2009. ^ "Economists' statement opposing the Bush tax cuts". 3 April 2003. Retrieved 31 October 2007. ^ Liossatos, Panagis, S. (2004). "Statistical Entropy in General Equilibrium Theory," (pg. 3). Department of Economics, Florida International University. ^ a b Solow, Robert (15 Jan 2010). "Paul A. Samuelson (1915–2009)". Science. ^ "Paul Anthony Samuelson: The Concise Encyclopedia of Economics | Library of Economics and Liberty". www.econlib.org. Retrieved 2016-04-26. ^ Levy, David M.; Peart, Sandra J. (December 3, 2009), "Soviet Growth & American Textbooks", SSRN Working Paper, pp. 8–12, SSRN 1517983, the optimistic forecast of time before the Soviet overtaking is 23 years; the more pessimistic time to overtaking in the max-max world is 36 years. The non-overtaking trajectory is constructed on the specification that something reduces Soviet growth in out years below what simple extrapolation would have it. ^ Bethell, Tom (October 1999). "The Soviet Experiment". The noblest triumph: property and prosperity through the ages. Palgrave MacMillan. p. 151. ISBN 978-0-312-22337-3. ^ Samuelson, Paul (1989). Economics, 13th Ed. McGraw Hill. p. 837. Fischer, Stanley (1987), "Samuelson, Paul Anthony", The New Palgrave: A Dictionary of Economics, London: Macmillan, 4, pp. 234–41, ISBN 978-0-935859-10-2 . Silk, Leonard (1976), The Economists, New York: Basic Books, ISBN 978-0-465-01810-9 . Sobel, Robert (1980), The Worldly Economists, New York: Free Press, ISBN 978-0-02-929780-3 . Fusfeld, Daniel R. (2002), "The Neoclassical Synthesis", The Age of the Economist (9th ed. ), Boston: Addison-Wesley, pp. 198–201, ISBN 978-0-321-08812-3 . Wikimedia Commons has media related to Paul Samuelson. Paul Anthony Samuelson (1915–2009). The Concise Encyclopedia of Economics. Library of Economics and Liberty (2nd ed.). Liberty Fund. 2009.